Source: Torrey, B. (1894). A Florida Sketch-Book. Boston: Houghton, Mifflin and Company. The narrator travels through the flat-woods of Eastern Florida and meets up with strangers. He comments on his experiences on his journey. The narrator describes his surroundings as he sits on the bank of the marsh. The narrator describes his stay on Daytona Beach and what he saw there — from birds to plays to scenery. The narrator describes his favorite road at New Smyrna. He mentions the river that runs along the road and the birds he has seen there. The narrator describes his journey to visit “the Old Sugar Mill”, a collection of ruins north of New Smyrna. The narrator talks of taking a “botanical stroll” along the St. John's River in Sanford. The narrator describes his unorthodox travels to an old cotton plantation estate. The narrator describes visiting the Murat estate. The narrator arrives in Tallahassee in time to hear a political economist speak. The narrator then goes on to describe Tallahassee itself. Torrey, Bradford. A Florida Sketch-Book. Lit2Go Edition. 1895. Web. 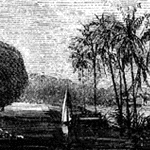 <https://etc.usf.edu/lit2go/130/a-florida-sketch-book/>. April 20, 2019. Bradford Torrey, A Florida Sketch-Book, Li2Go edition, (1895), accessed April 20, 2019, https://etc.usf.edu/lit2go/130/a-florida-sketch-book/.